DemoCurmudgeon: Ryan punts on tough NPR questions over deficit, disappearing middle class deductions, and then just lies. Ryan punts on tough NPR questions over deficit, disappearing middle class deductions, and then just lies. NPR's Steve Inskeep: So that was your goal, was a middle-class tax cut. But what does it say that — in practice according to independent analyses, I mean you do have winners and losers, not everybody gains, businesses gain, people with large estates to leave to their heirs gain, high-income people gain — but a lot of middle-income people do not gain in terms of money. Paul Ryan: I disagree with that. The average tax cut for a middle-class family is going to be $1,182. NPR's Steve Inskeep: Average, meaning not everybody. NPR's Steve Inskeep: At the same time, a lot of deductions go away and it's not necessarily what you'd think of as a special interest deduction. We've reported that 9 million people or so use a deduction for medical expenses, excessive medical expenses, and that deduction goes away. A lot of them are ordinary people with kids who have severe trouble. Paul Ryan: But it's typically a higher income person ... the whole point of this is, and the analysis is very clear, this is an average tax cut for every taxpayer on average. You can't run a number for every single 330 million people in America. But it's designed to provide tax relief across the board. NPR's Steve Inskeep: 'Lily Batchelder of New York University took some numbers from the Joint Committee of Taxation, bipartisan part of Congress as you know very well, and concluded that something like 100 million households in this country under the House bill, and even more under the Senate bill, would either get no tax cut or would get a tax increase. Does that sound right to you?" Paul Ryan: "No, it doesn't sound right unless it's a person that's not paying taxes already. I haven't seen this analysis so it's hard for me to go into it. But because of the Senate budget rules, there are some sunsets in the law, in the later part of the decade where some of that tax relief goes away." NPR's Steve Inskeep: "It gets worse in later years, that's true." Paul Ryan: "...if history is any guide, Congress has a very strong practice in history of not removing a middle-class tax relief like we didn't in 2010." NPR's Steve Inskeep: "But help me understand that ... trusting that a later Congress would fix it, which means the deficit gets worse or it doesn't get fixed. Why does that make sense?" Paul Ryan: "Well first of all history, if ... 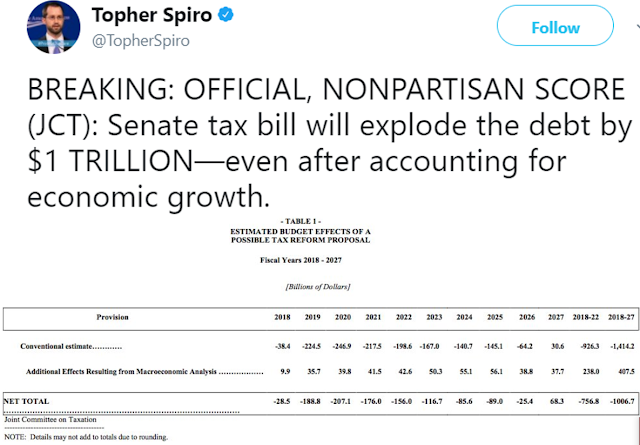 But I'd also attest to the fact that this is going to produce economic growth...."
NPR's Steve Inskeep: "You cited a study finding that that economic growth can come from the business tax cut. We could also cite a study from the Institute for Policy Studies casting questions or raising questions about that. We don't want to go back and forth with studies, but you do know that it is possible that businesses will take their tax savings and simply give it to stockholders in the form of dividends, or simply hold onto it in cash or buy back stock. What if they do? Does it matter to you?" Paul Ryan: "That's still not an excuse not to put American businesses on a more level playing field with the rest of the world. NPR's Steve Inskeep: "Why is it okay to increase the deficit, as this tax bill will do?" Paul Ryan: "Actually I don't think it will increase the deficit. That's my entire point. I don't think this will increase the deficit ... We need — we have far more work to do to control spending ... but if we don't pass this tax law, we will not get the kind of economic growth we can get in this country. And if you want to get the deficit and the debt under control, control spending, grow the economy. This grows the economy. NPR's Steve Inskeep: "If you'll forgive me, Stephen Mnuchin, the treasury secretary, has also said that this will spur so much economic growth it will pay for itself. It will bring in more tax revenue." Paul Ryan: "I think that's quite possible." NPR's Steve Inskeep: "He said that, but the Treasury Department has been unable to produce an analysis proving that." Paul Ryan: "Yeah, I really think we're at a global economic focal point ... if we do this and put America at the head of the pack ... we will get much faster economic growth. And that faster economic growth clearly produces more revenue, more jobs, more take-home pay. That's a good thing. That's why I feel confident this is going to make a very very positive difference in the lives of millions of Americans."